One of the most difficult disciplines to master isto become persistent in prayers. I cannotpossibly count the number of times I have renewedmy vow to God, which includes making a freshcommitment to pray regularly. However, it seemedto me that no matter how hard I tried to seek theLord in prayer, the more I gave up after a shortwhile.I know that I am not alone by far. I read someresearch recently … from a popular faith basedmagazine that only 1-in-5 Christians have a regular,scheduled daily prayer time.After a careful self-evaluation, including adetailed research as to why I followed this particularpattern, I came to the conclusion that the mainreason I kept on giving up was, my prayer life had nostructure at all.The bible says that where there is no vision thepeople may perish. My daily prayer schedule neededvision and structure. So I decided to ensure that mysupplications were more thematic and directed todeal with specific subjects on a daily basis.After organising my prayers I saw tremendousbreakthroughs in many areas of my life including myfinances, my church, my emotions, behavioural andof course my attitude towards my enemies.I have outlined a few of my daily devotionalreadings for you to muse over and pick you up alittle bit. 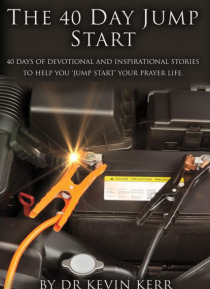 I sincerely hope and trust that they will behelpful and as you endeavour to ';jump start' yourprayer life! Before you start reading this material, pleasebegin your 40 days of seeking God by asking themerciful Father to forgive your all those sins thathinder your experience with Him and cause you tohave inner feelings of guilt and condemnation.When we ask for forgiveness, we are reassured inthe scriptures that no matter how terrible weregard our actions to be, the blood of Christ has theefficacy to continually cleanse us daily from allunrighteousness! (1 John 1:9)';Return unto me, and I will return unto you, saiththe Lord of hosts.' (Mal. 3:7) Dr Kevin Kerr is Senior Pastor & founder ofLiberty Christian Ministries a thriving dynamicChurch in the UK. He is also the founder ofLiberty Training Institute, a seminarian, an avidbible teacher, motivational speaker andcertified life coach.